Health officials in Reunion are reporting an additional 59 dengue fever cases from the week of July 16, bringing the outbreak total to 6,345 cases confirmed since the beginning of 2018 (including 5 imported from Polynesia, Brazil and Thailand). To date, 134 patients required hospitalization and one death has been assessed as indirectly related to dengue fever. The DEN-2 serotype is predominant. Realization of a dedicated visual message, valuing in turn each person, professional or particular involved in the fight against dengue, to show the involvement of all concerned actors. Promotion of initiatives related to public awareness operations organized by partners throughout the island, the residents of the most affected neighborhoods, leisure centers, etc. 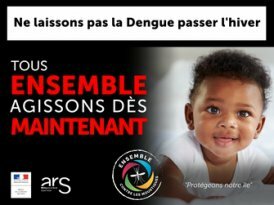 Information on the websites of the Préfecture and the ARS Indian Ocean and communication on social networks: Facebook Together against mosquitoes, Twitter of the Prefecture. Relay via the communication tools of the partners involved in the fight against dengue. Other communication actions within the municipalities and with partners will reinforce this system.